Intrigued by the experience of viewing a friend’s Twitter timeline, angel investor Shervin Pishevar collaborated with 15 year-old iTunes Instant creator Stephen Ou to create Twtroulette.com after a week of work. 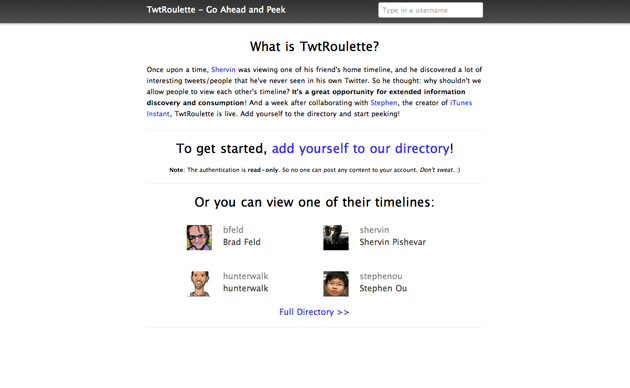 With Twtroulette, users can now visit what industry notables like Mike Arrington, investor Brad Feld, and YouTube’s Hunter Walk see when they open Twitter i.e. what it’s like to follow the people they are following. 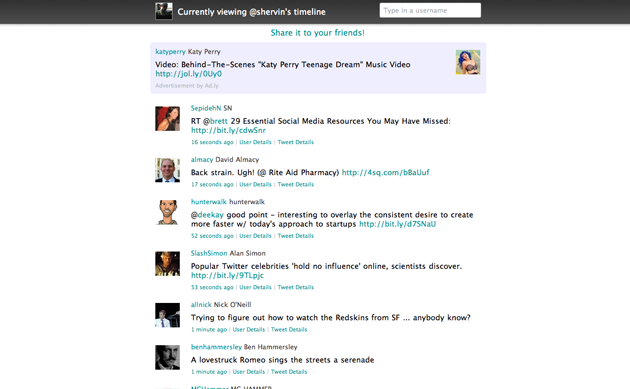 People can also volunteer their own timelines by adding themselves to the directory. And, like Chatroulette, there’s a random function so one can shuffle through profiles if they’re feeling lucky. “In my quest to see the New Twitter, I had a friend who had it login into his account, so I could see it. When I was on his account I had this funny feeling; like I had stumbled upon someone’s account who forgot to logout of their Facebook or Twitter account at the Apple Store. Ou’s Twtroulette is one of the first projects launched through Pishevar’s nascent incubator, incubator.co. Pishevar and Ou plan on adding more features that further expand the use case possibilities of Twitter shortly.